Is there anything more mouthwatering than a heaping helping of mac and cheese? Many folks in Florida would likely say no. The Sunshine State knows cheese, and it shows in the abundance of game-changing mac and cheese dishes found in some of the state’s best restaurants. These 10 best places for mac and cheese in Florida rival that of any home cookin’ hot spots in country. Part mac and cheese-ery, part board game cafe, you’ve never experience cheesy cuisine quite like this anywhere else. They’re the most innovative thing that’s ever happened to this staple dish, offering a make-your-own option to craft your perfect flavor: just choose your cheese, add a couple mix-ins like bacon or truffles, and you’ve got an original dish you’re sure to devour. This mac and cheese is so out of this world that it was deemed worthy enough to be a main course, not a side item. Served in cast iron skillet, you can order it as is or top it with shrimp or Buffalo chicken for a unique experience. You won’t find any cheesier mac and cheese than right here. Datz has some of the best of everything, but their mac and cheese is a clear winner. Their mac bites give the perfect balance of spicy and cheesy with a touch of bacon mixed into every bite. Get it as an app, as a hot dog topping, or inside their famous stuffed meatloaf. One bite of Big Pink’s baked mac and cheese will have you believing you’ve stumbled into Grandma’s kitchen. It’s a little bit of crispy and a whole lotta cheesy, and they serve it by the boatload. Grab a traditional order to share with the table, or opt for the chili mac variety to keep it interesting—either way, you can’t go wrong. There’s a lot of cheesy happenings on the menu here, but most notably is their Mac Attack Wrap. Mac and cheese fuses together a blend of tomatoes and bacon in a blanket of panko bread crumbs for one of the most unique wrap experiences ever created. They also offer a DIY mac and cheese, where you can add sausage, beef, chili, broccoli, or a number of other toppings for your ideal meal. The Happy Grilled Cheese proves that great mac and cheese is born from a food truck. These grilled cheese sandwich masters are known for their appreciation of all things cheesy, but their homemade mac and cheese isn’t to be missed. They’ve also got a brick and mortar restaurant for those who don’t want to cheese-and-run. Their mac and cheese balls redefine everything you thought you knew about this staple side dish. Creamy cheese and noodles are breaded and fried, then served with a side of marina and fonduta for dipping. It’s every bit as tempting as it sounds, and they won’t last on your table for long. If you’re longing for southern comfort eats, you’ll find more that what your appetite can handle here. Their menu features something for even the pickiest eater, but you’ll want to head straight for the mac and cheese. Homemade and baked to perfection, their generous helpings pair perfectly with their country meat and veggie plates to give you a satisfying meal. This up-and-coming Florida chain started with just one location, and has since blossomed into three total Florida eateries with a few more on the way. Dedicated to all things cheese, their mac and cheese makes the perfect main course. In addition, they also serve them in bite-sized pieces or tucked into a sandwich—you’ll want to try them all! 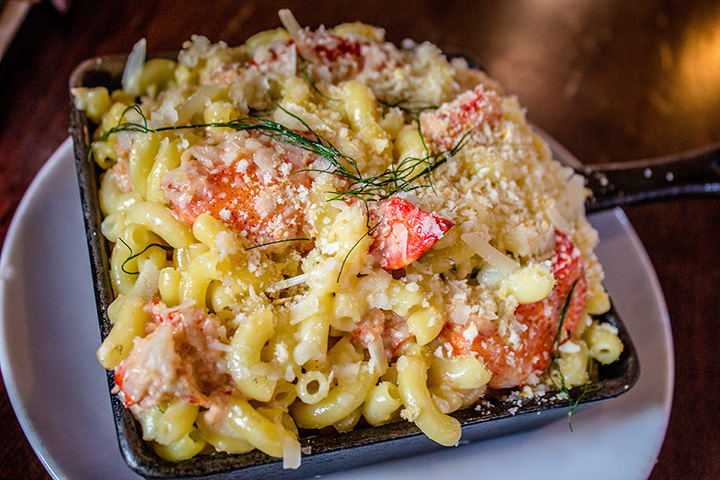 This place is well-known for its glass-bottomed bar that lets you safely experience what’s lurking below the water, but their lobster mac and cheese is equally deserving of recognition. Baked to perfection in a cast iron skillet, their large penne noodles and three-cheese blend make the perfect culinary treat you’ll want to order more than once. Whether you love lobster or not, you won’t be able to stop yourself from scraping the pan clean.